MENLO PARK, Calif., May 21, 2018 /PRNewswire/ -- Summer is typically when workers take time off to relax and recharge. But just because employees take vacation days doesn't mean they're completely checking out, according to a new survey from staffing firm Accountemps. While 44 percent typically don't check in at all with the office, the majority will. In fact, 70 percent of respondents ages 18 to 34 will maintain some contact with work compared to only 39 percent of those ages 55 and older. Never out of office: Nashville, Dallas and Los Angeles lead in terms of the number of workers who plan to take no summer vacation. Checking in constantly: Employees in New York, Charlotte, Los Angeles, Miami and Seattle are most likely to connect with the office at least several times a week. Leaving town and never looking back: Professionals in Cleveland, Minneapolis, Denver, Philadelphia and Salt Lake City are best at disconnecting from work while out of office. 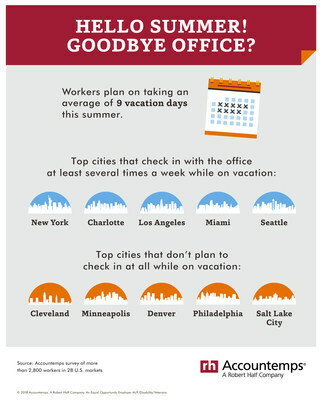 View an infographic of workers' summer vacation habits by city. Data tables of the research by age and gender are also available. Findings from similar surveys show employees are more connected to the office than ever: In 2016, a majority of workers (59 percent) said they never check in while on vacation; that number fell to 47 percent in 2017 and 44 percent this year. Michael Steinitz, executive director for Accountemps, gives insight into the trend. "Employees need time away from work to rest, relax and recharge. Yet for an increasing number of people, totally disconnecting from the office can have the reverse effect and add stress," he said. "Some workers enjoy greater peace of mind when they allow themselves to check in a few times — but not much more than that — while on vacation," Steinitz added. "Doing so confirms that all is well, which allows them to stop worrying and focus on relaxing instead." For more advice on how to disconnect from work while on vacation, visit the Robert Half blog. The survey was developed by Accountemps and conducted by an independent research firm. It includes responses from more than 2,800 workers in 28 U.S. markets. Accountemps, a Robert Half company, is the world's first and largest specialized staffing service for temporary accounting, finance and bookkeeping professionals. The staffing firm has 325 locations worldwide. More resources, including job search services and the company's blog, can be found at roberthalf.com/accountemps.